A lot of companies have e-mail marketing strategy where they blindly bombard bulk e-mails to a vast number of people hoping to turn them into customers. But they have come to realized that such e-mails most of the times are not even being read by the people. The e-mails that seem to be useful are personalized e-mails. Not only do these e-mails contain the name of the person but also products and services that they were previously searching for. This makes them interested in them. Thus, making personalized e-mails is a better strategy for businesses. Twitter is one of the world’s largest social media platforms. Though the platform has been doing well, the number of twitter users in India does not seem to be rising. Very few Indians are active on Twitter. Therefore, businesses who have marketed on the platform have not seen good returns on their investments. That is why they are moving to other platforms where they can get a better response from their audience. Earlier it was believed that the best way to connect with audiences was to constantly post content on social media. But, when the volume pumped out is huge, the quality of the content is bound to take a hit, turning them into low quality posts. These low quality posts are ineffective in persuading people. That is why focus is shifting towards posting better quality content that is eye catching and more persuasive. The organic reach on Facebook has reduced considerably over time. Today, if you want to reach your audience you need to run paid campaigns of Facebook. It has also introduced a new feature for brands to have a better reach known as Explore Feed. Here users can view posts that are more relevant to them. Long video advertisements are unwanted by the audiences. Any add which is longer than 6 seconds is undesirable, especially when it comes to YoutTube, the world’s largest video sharing site. As users always chose to skip ads after the 5 second window, longer ads are not being viewed to its entirety, thus rendering them ineffective. That is why shorter video advertisements are currently more desirable. It is important to keep track of the trends especially those which are losing steam in order to invest in strategies which are effective. Also, if you are joining the work force you need to know the latest trends in digital marketing as that is what your employers expect. 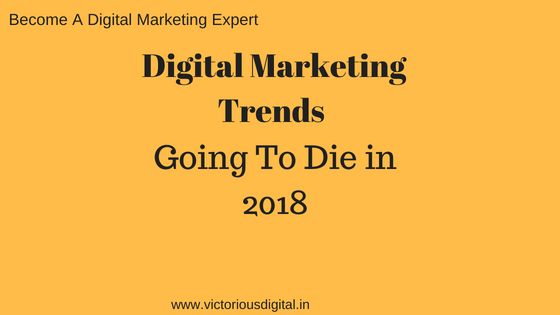 That is why to stay updated with the current trends, you should learn digital marketing from a place that gives you the latest knowledge and trains you to become an expert. Join the best digital marketing courses – Victorious Digital and get started.